Weathervanes are highly appealing forms of Americana and collectors who pursue these folky artifacts per highly individual collecting tastes (whether one collects horses only or all creatures great and small or made by a certain firm, rest assured there will be plenty of great examples to choose from. And at Stella Show Mgmt Co.’s Antiques at the Armory show, at the 69th Regiment Armory January 20-22. , several dealers have already highlighted some prime specimens. 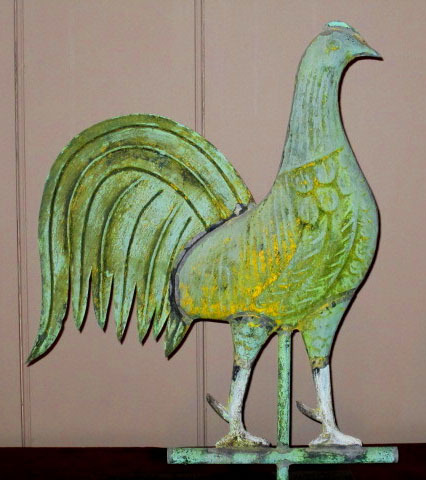 Chuck White Folk Art and Antiques, Warwick, N.Y., will showcase a gamecock weathervane (shown at right) in wonderful verdigris surface, attributed to Cushing & Sons. In 1883, the company catalog offered a 17-inch tall example of a gamecock vane for $12 while a full-bodied version at only 9 inches was but $8. For more information, www.chuckwhiteantiques.com or 845-544-2612. Folk art specialists A Bird in Hand Antiques, Florham Park, N.J.. will feature this sheet metal weathervane of a folky folk of four ducks (shown below) that retains its polychrome paint. The vane measures 28 inches long and dates to circa 1800s. For more information, www.abirdinha nd.com or 973-410-0077. Michael Whittemore Antiques & Folk Art, Punta Gorda, Fla., will show this “St. 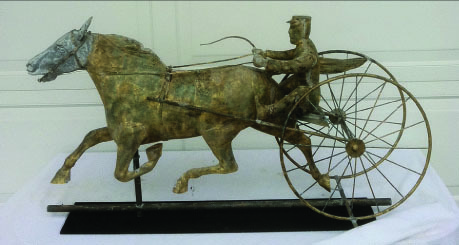 Julian” sulky and driver weathervane, manufactured by J.W. Fiske, New York City, gold leaf and verdigris surface, circa 1880, 23 inches tall and 42 in ches long. Racing horse vanes were popular in the 1800s and were modeled after Currier & Ives prints of famous racing horses. For more information, call Whittemore at 860-428-1135. For show information, http://www.stellashows.com or 973-808-5015.